Across all the examples of social innovation presented here, a consensus emerged among officials and policymakers about the importance of economic growth to Dover District Council (DDC) and the importance of the Council to the growth agenda. The key word used by officials and politicians in Dover in describing their general values and policy orientation is regeneration. A drive for regeneration has been the main focus of the local “welfare system” and is the first strategic priority of the Council’s Corporate Plan1. The aim is not only to physically regenerate the area, but also to ensure all residents access economic benefits. In the concept of “regeneration” housing and employment opportunities are intricately linked. Indeed, what characterises the underlying dominant approach in Dover is that plans in both these policy fields need to be addressed together. Business regulation, street cleaning, community safety and planning are all critical to creating a business-friendly environment, and lie in the hands of local authorities. Councils are well placed to co-ordinate and broker local resources, and bring together residents, businesses and different public sector agencies to work towards a common goal. The Council’s response has been to make tackling regeneration “the priority of the Council in terms of major projects, investment and partnership working”2. The key orientations and values to note in this statement are major and partnership. Even before the recession, services for which local authorities are responsible were struggling to respond to changing expectations and demographic shifts. The UK government has perceived the crisis in public finances to be deep and urgent. Public services in England are facing the stark reality of needing to decide what to cut. The current financial climate has increased the pressure on locally organised services and made the demand for new solutions even more pressing. The government’s spending plans require public sector organisations to consider changes to the way that local services are delivered … Over the next few years, we are facing a changing local government environment with new partnerships and alternative ways of working and a shift from councils directly delivering a multitude of services4. Many in government at all levels believe that the challenges faced call for a rapid expansion of the role of innovative civil society organisations, social enterprises and other non-traditional providers in a market for public services. Such a radical change is being hastened by the opening up of contracts to provide public services to a greater range of providers and the emergence of new forms of finance, including social finance, philanthropic and commercial investment. In consequence, the other notable feature of the local welfare system in Dover is the debate about how to deliver the Council’s priorities of growth, jobs and investment in an environment of ongoing financial constraints, the national government’s Big Society agenda and the need for establish alternatives to Council-delivered services. For example, the Council’s Corporate Plan 2008-20 stated that role of the Council in respect of the voluntary and community sector (VCS) would seek to deliver services in different ways, including devolving services to the VCS and others5. It stated: “We have been working closely with partners to support, enable and encourage development and enterprise”6. “Partnership working” has more than one definition in the context of the Council’s relationship with the VCS The nature of the relationship depends on how the Council works with the organisation, such as whether it was the commissioner of a service or providing support and expertise to another group. This way of working raises a number of issues. One potential risk is that of an alternative provider defaulting on service delivery. The support the Council offers to the VCS for activities, other than funding the provision of services, is primarily administrative support to organisations using the expertise developed by the authority in delivering its own projects. This can include assisting in the development of constitutions for VCS groups, assisting in the completion of funding applications, and attending meetings. The Council has also taken steps to involve the VCS by being a partner in the Dover and District Compact, which represented local groups and public bodies working together to achieve objectives for the local community7. The Compact provided the Council with a greater understanding of how the VCS worked and provided a focus for corporate strategic awareness in involving the community and voluntary sector8. Inequality, whilst receiving less attention than regeneration, does have some priority. In 2006 the Council identified the general issues facing Dover then as including “high levels of deprivation”9. Their diagnosis at that time was that “the town is suffering from lack of investment that has led to the high levels of deprivation within its urban ward.” The Council’s Annual Monitoring Report 2010-11 showed there had been an almost doubling in the number of areas that are within the 20 per cent most disadvantaged in England. It was felt by the Council that, “The cause and impacts of the increase in the number of most disadvantaged areas in the District needs to be investigated further”10. Everyone (communities, public services, local businesses and individuals) has been affected by the national economic downturn. It is therefore important to focus on economic recovery and growth and continue attracting and enabling inward investment to the district, to support the creation of local jobs, and aim to keep wealth locally to see our district grow and thrive11. Concepts such as “reducing inequalities”, “social cohesion” and “social inclusion” have not been recurrent in the public discourse in the last 10 years, except in the field of housing, perhaps because of the Council’s limited resources. In housing, the Council wants to see delivery of more affordable homes, as well as improving the condition of existing homes, addressing inequality, and enabling vulnerable people access to quality housing to live independently. 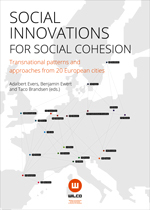 However, despite the constraints on direct activities by the Council, it clearly favours social innovations that target “social cohesion” at the “local level”, although they are not using that vocabulary in discourse. The social innovations with most high profile and pro-active Council involvement right now outside of housing policy aim to raise aspirations, educational attainment and skills. Thus the Council’s position is that “training and education is linked to economic growth” rather than a direct social cohesion or social mobility agenda. The approach adopted is one of an “enabling role working with local employers and training providers to identify skills shortages to meet local business needs and improve access to local job opportunities”12. These have included working with the Homes and Communities Agency and Hadlow College to develop the Betteshanger Colliery and Fowlmead Country Park sites as a Sustainable Futures Campus (a mixed use educational, employment and tourism facility) to secure the long-term future of the area and working with partners to enable and facilitate a training centre of excellence for the marine skills sector13. Other social concerns have included, and continue to include, health, partly because the long-term health problems encountered by former miners are well known and Dover has been no exception to this. In view of such statistics as life expectancy, which is 8 years lower for men and 2.3 years lower for women in the most deprived areas of Dover compared to the least deprived areas, and the statistically significant relationship between living in the poorest wards in Dover and the likelihood of having an urgent hospital admission, the Council intends to address health outcomes in the district in future14. Local government can have an impact on health through sports, open space, housing, planning, social care and a range of other services. The Council has been working hard to input into planning the right services for the Dover communities by, for example, creating in partnership a local Health and Well-Being Board to identify health and social care needs and improve health outcomes15. This document outlines three social innovations from Dover. The first two described – Aylesham Neighbourhood Project (ANP) Family Learning and Happy Feet Pre-school – are run by the VCS. The third innovation – East Kent Housing (EKH) – is an example of improvement in council services brought about by reorganisation. ANP and Happy Feet Pre-school offer services in all three policy fields that are the focus of the WILCO project, i.e. housing, employment, and child care. Indeed, the most innovative and successful aspect of their work is precisely that they recognise that improving the circumstances of an individual frequently involves improving the well-being of the whole family. Often this can best be achieved by giving support with a number of inter-related issues ranging from unsatisfactory housing conditions, to low literacy of the adults in the family, to problems managing children’s behaviour and delayed child development milestones. The other important component of success that is shared by these two social innovations is that they are seen by their clients as separate from council-run or national government-run services (e.g. social work, JobCentre Plus, or the Work Programme), which the service users may have had bad experiences with. The descriptions in this document are based on interviews with staff working in the services, local politicians, and district and county council officials. Offer often fragmented forms of support under one roof. Personalise support in order to address critical situations affecting the whole family. Involve flexible forms of ad hoc support. Are perceived by users as welcoming and not part of the “establishment”. The major innovation of EKH is to work beyond the political boundary of the local authority. This demonstrates that a local council area is not always the most logical geographic area over which to plan services.